That was unexpected. Today I went to Giorgio Armani Counter to check bronzers and blushes and look what I have found. I don't remember seeing promotion pictures of this range but Armani have done it before, I mean keeping it all secret and releasing a whole range. 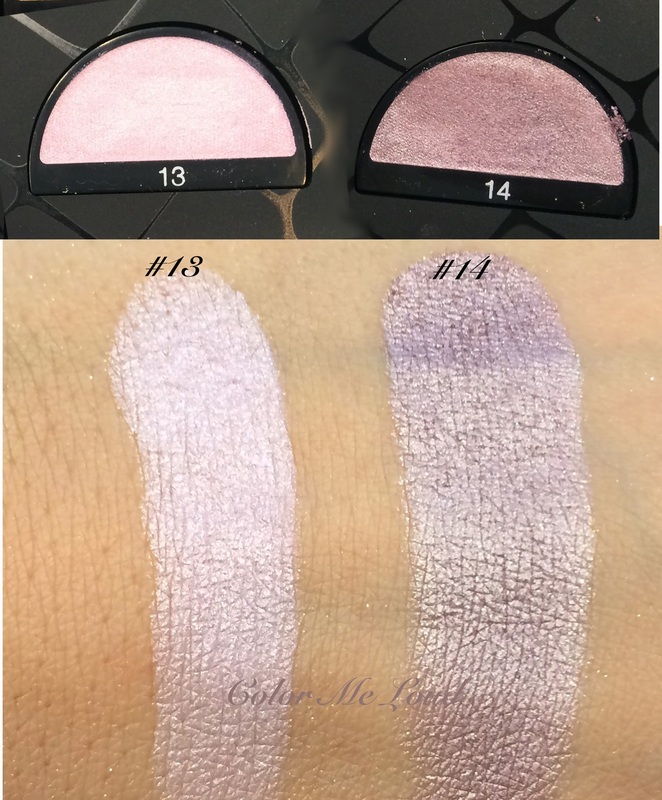 It was a very nice surprise, I remember counter manager telling me that they are expecting a new range of single eye shadows sometime last year so in the end it was expected but maybe it was me who was not informed. I played around with these for almost an hour and took some photos for you. I really liked the arrangement (above) of the shades like a wave. They are divided into three categories, matte, vivid and satin. I was a little confused that all bright purples, pinks and that acid green was classified as satin, not vivid. I even thought for a brief moment if they made a mistake while setting up the display. I don't think it is the case though because numbers increase and each category have different number of eye shadows. 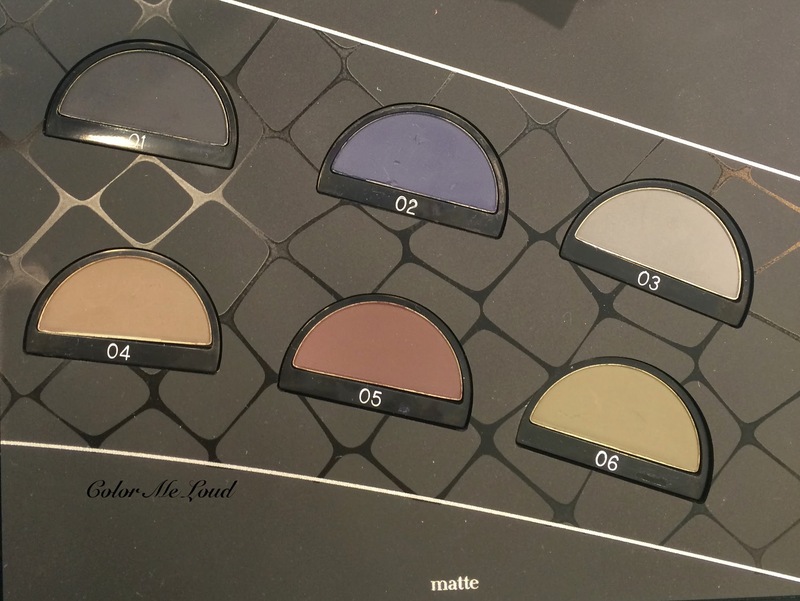 Matte range: 6 eye shadows here. They are all very pigmented. 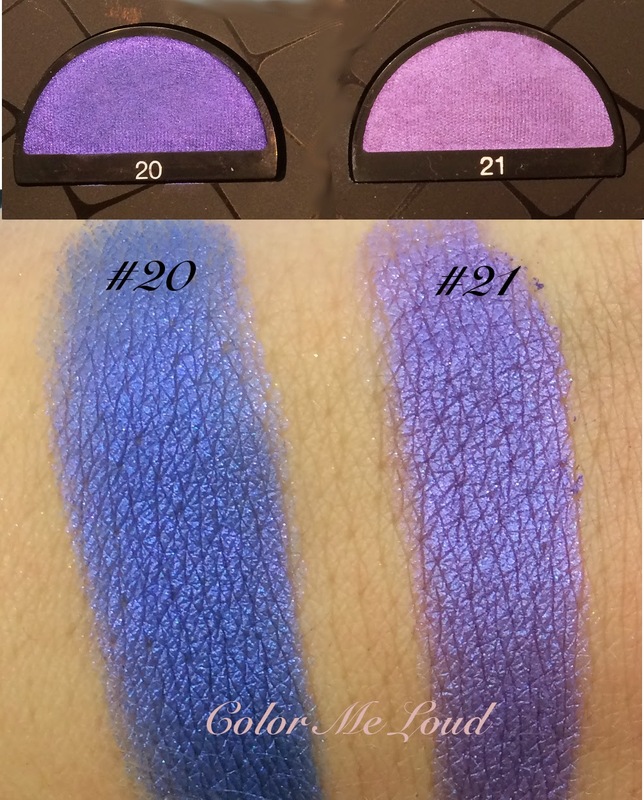 Here are some photos and swatches. 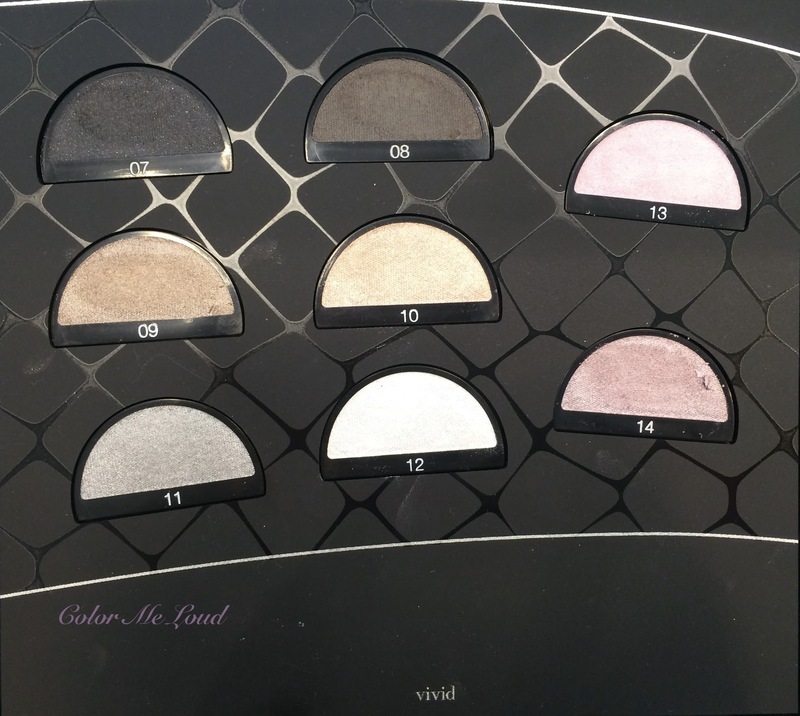 Vivid range (as I said, I am very confused about this name) consists of 8 eye shadows, they are shimmery naturals. 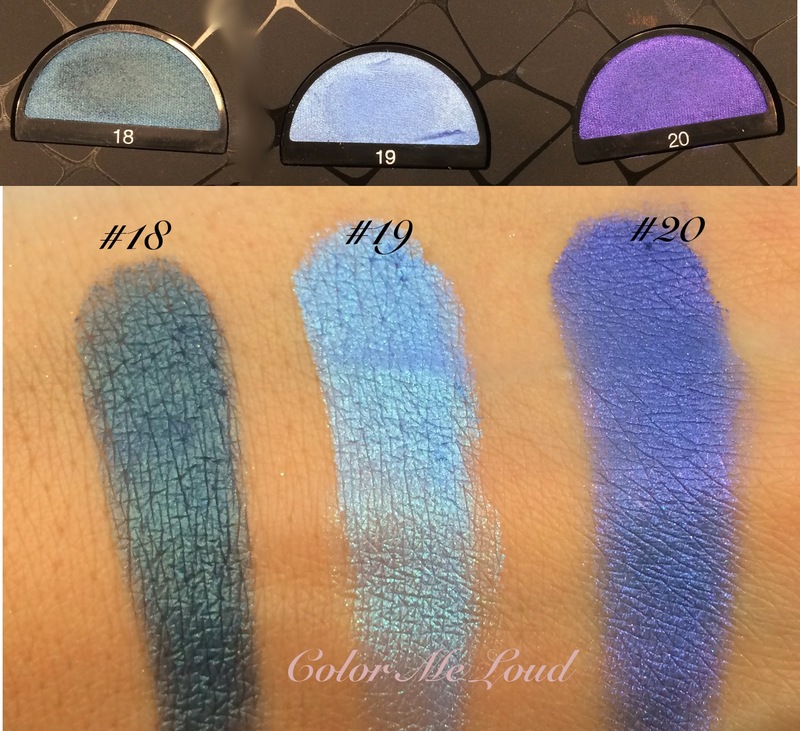 The range offers cool and warm shades as well as deep and light ones. 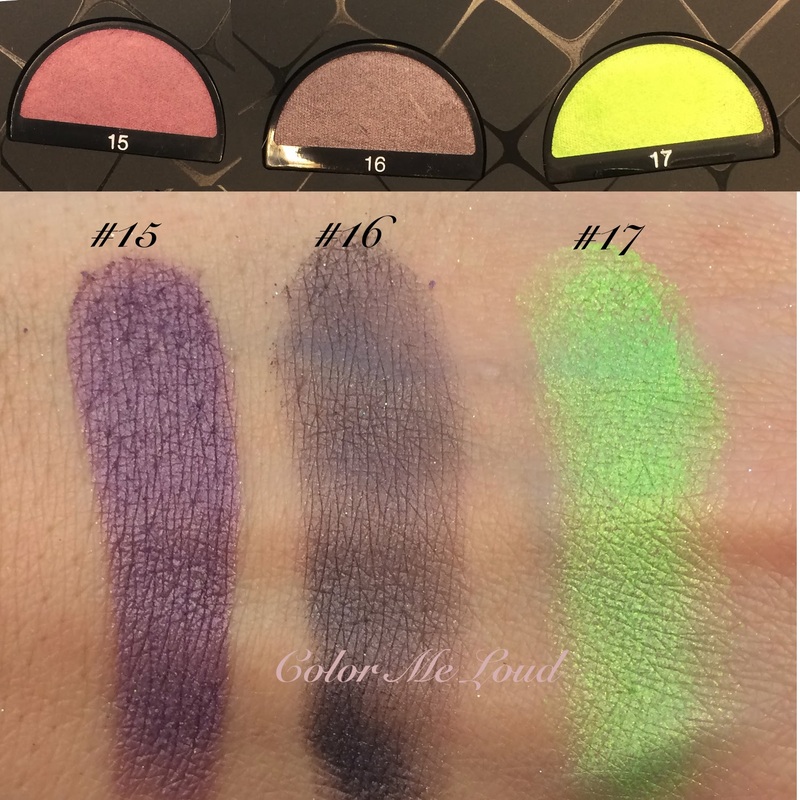 All of them were very pigmented, #10 was a little less pigmented than the others. My favorites here are #9 and #14. Enjoy some swatches. Satin range (wouldn't vivid be more appropriate?) 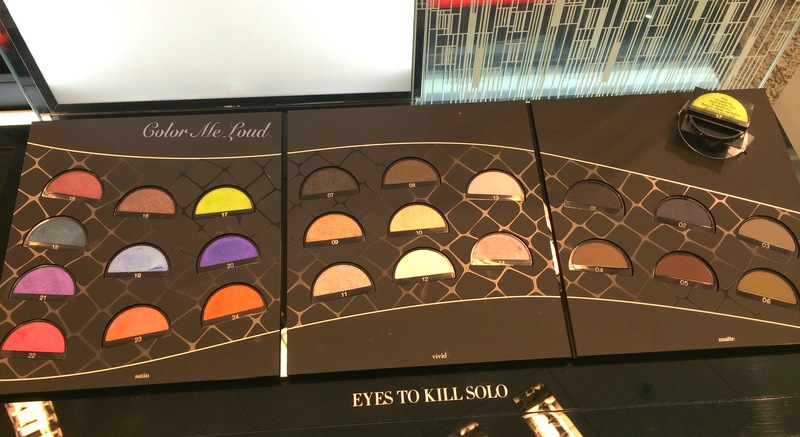 consist of 10 eye shadow singles. Isn't it great to see an acid green as a permanent shade of a high-end brand? 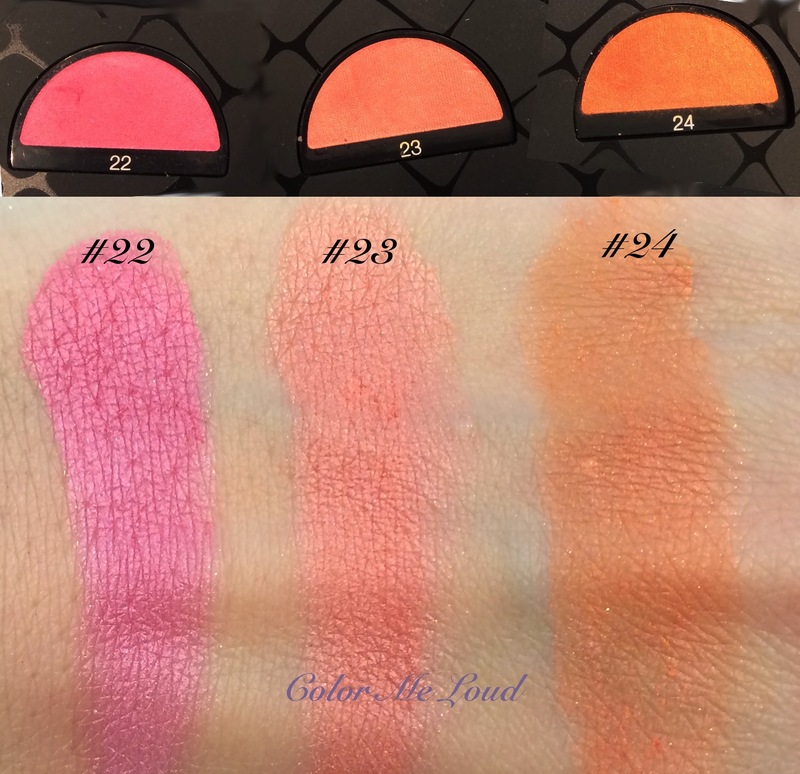 What about those blush type of colors, #22, #23, #24? Bravo Maestro! Those were also very pigmented, a few of the shade were somehow a little drier in this category than the others. My picks are #15, #18 and #21. There was only one shade which didn't perform all that well, that was the orange one #24, was a little dry and less pigmented than the others. But all in all all thumbs up. Enjoy some more swatches. Final thoughts: A very fun range from Giorgio Armani, which reminds me why I like his line of make-up so much. If you found the last releases of some other brands (!) a little boring, these are for you. Regardless of what your taste is, I am sure you can find shades you would like here. 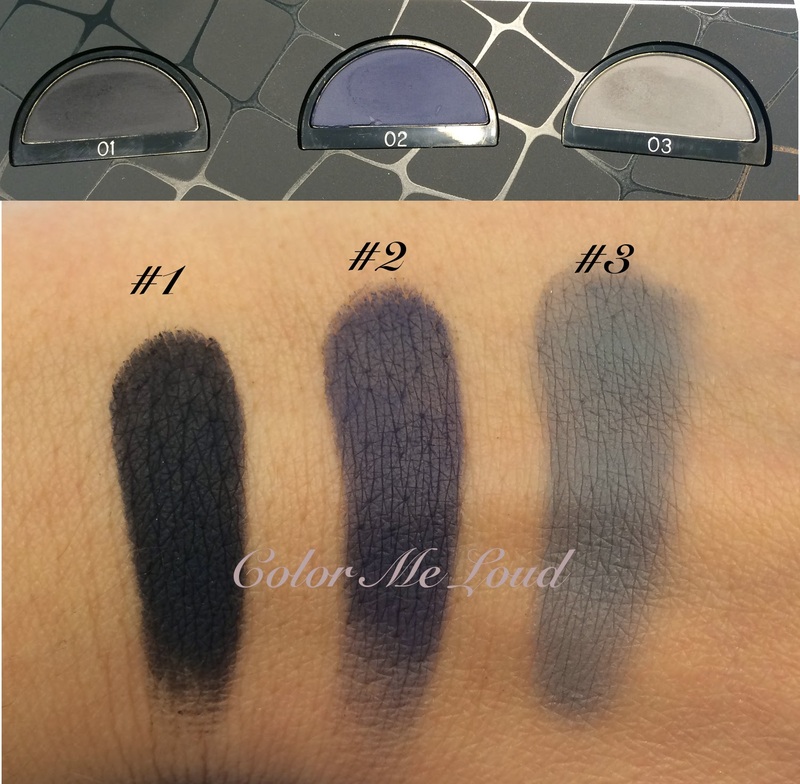 Giorgio Armani Eyes To Kill Macro-Color Eye Shadow Singles contain 1.75 g of product and cost 32€ in Germany. #9 looks like Pale Barley! You are right, they are close but #9 is more saturated and deeper. I always wanted a "not so pale" Barley, this must be it. Oh wow, thanks for the heads-up, Sara! I don't think I've even heard of these at all! I think 9 is my favorite, too. That and maybe 8! 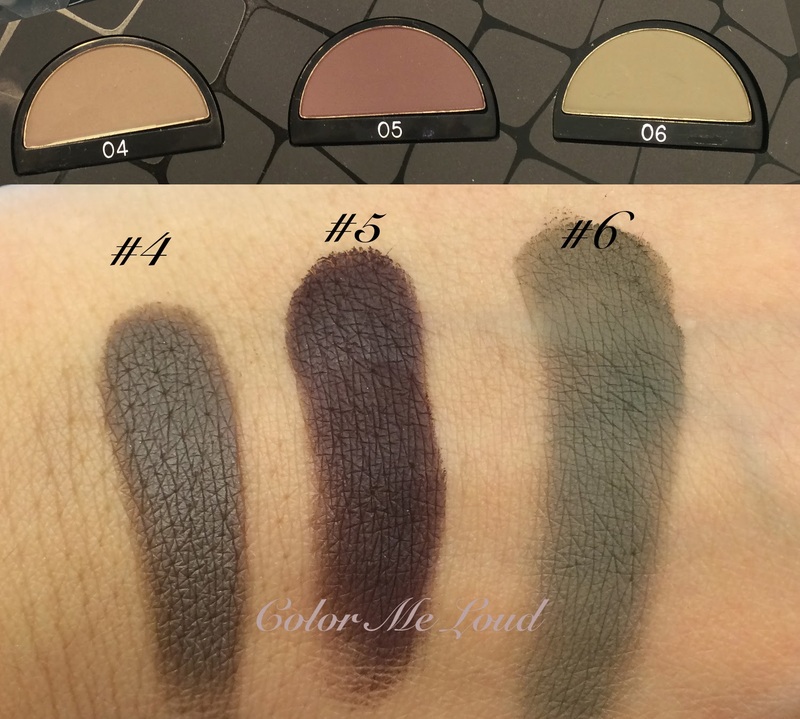 Yes apart from just a few shades, all of the shades are pigmented and creamy. Lovely formula and the range of shades is very fun :-) those last shades remind me of your pink eye makeup for Guerlain lipstick post, which looked stunning on you. OH MY HEAVENS! Those mattes look gorgeous, too. Yes, right, not many lines have so many mattes to choose from. I think they nailed it with this release, fun and elegance at once. Oh my goodness #9 is just gorgeous!! I hope to see a review at some point then! Sara, thank you for the comprehensive preview! No. 9, 10, 11, 12, & 22 are beautiful! 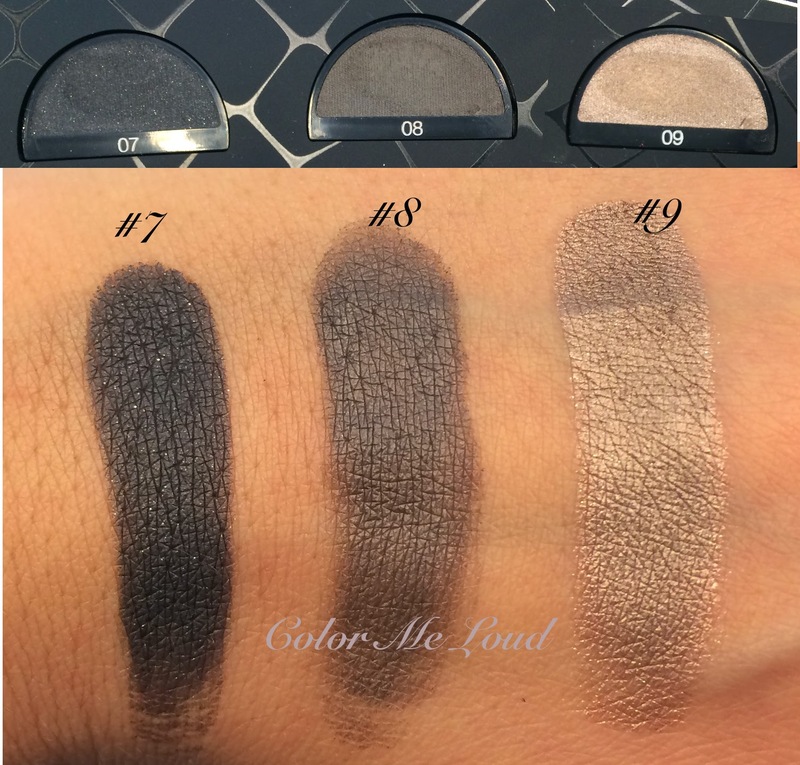 These eyeshadows made their debut at the Armani Prive S/S 2014 show in late January. I believe No. 11 and No. 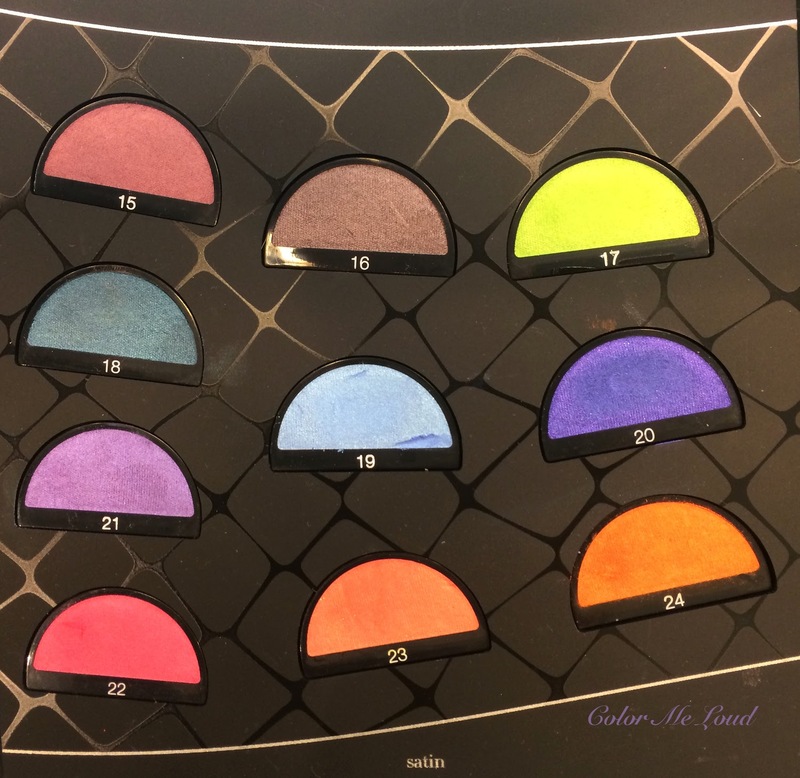 7 were the colors used on the models' lids. It's like stumbling into makeup heaven! I'm going to have to stalk the GA counter everyday until I get my fingers into these! I seriously almost left all my money there but then I could hold myself since there are discounts starting next week Tuesday, I didn't want to pay more for the same product. I might have to get 15 and maybe one from mattes... I must endure! Exactly! #17 and #23! Love them both... I don't think I have any dupes to these lol. Where did you find them, Sara? these are released in Germany exclusive to Breuninger at the moment but Douglas is about to receive them as well. Since I don't know where you are located, it is hard for me to answer. wow they are so pigmented! Absolutely agree that this is a great, edgy collection from a high-end brand. I can't wait to try these in person!! I can't wait to see which of the shades you pick up. They are all so drool worthy, I am having hard time choosing one myself. Oh, I see how you can get confused with the categorization, but I think they're categorizing it in terms of finish/formula, not color intensity/vibrancy. 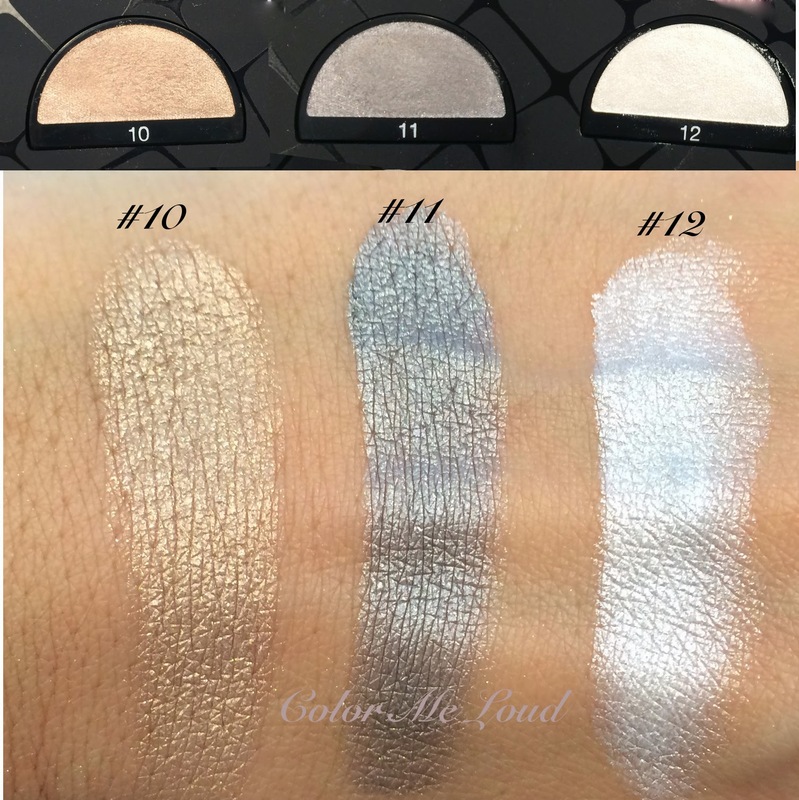 Based on your swatches, I'd say the Vivids are highly reflective with shimmer, sheen or frost; whereas the Satins and Mattes are just that, satins and mattes! I hope that helps.